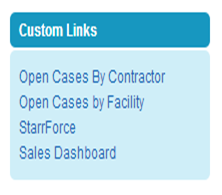 There are two types of Salesforce sidebar custom links available for the Sidebar in Salesforce; “Standard Component” custom links and “Custom Component” custom links. 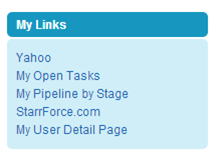 Usually, when we see custom links being used in Salesforce on the sidebar, they are of the “Standard Component” variety. This is not necessarily the best option for a variety of reasons. The difference between the two is like the difference between buying “Off the Rack” or “Tailor Made”; one size does not always fit all. The “Standard Component” custom links are quite basic and they have some limitations, such as: Limited to 15 links in the component; No ability to segregate links by page layout; Links always open in the same window, possibly taking you out of Salesforce; No ability to use Merge Fields. 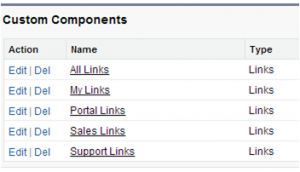 With “Custom Component” custom links, you first build the links and then add them to various custom link components. When building Custom Component links in Salesforce, you have the ability to use Merge Fields and control the Window Open properties. So, you could have a report pop-up in a smaller window with advanced filter criteria. Or, you could create a link that takes the logged in user directly to their User Detail Page. In the screen shots below, you see the links in the Standard Component and then the same links on the sidebar of the home page. Since the Standard Component is a “One Size Fits All” object, when you put this component on a Salesforce page layout, all users have the links even though Support probably does not need the “Sales Dashboard” link. When you create Custom Components, you can place the links on different page layouts, keeping the links relevant to the Salesforce users and reducing clutter. The screen shot below shows various custom components, which can be placed on none, one, or many page layouts. You can even place more than one component on a page layout. StarrForce is a Salesforce Partner that believes marketing, selling, and supporting customers should be simpler. If you would like information on the services we offer call us at (888) 391-4493 x101.